May is always a month of graduations, and I want to wish all of our AUP graduating seniors the very best of luck. Pictured Right: William Singletary, Class of 2013 (top row, third from right) led AUP Unit at The Citadel to be one of the most respected and successful in the nation. BM3 Singletary, USCGR, serves at Station Charleston, SC and will soon continue his service as a member of the AUP staff. I am immensely proud of you and all that you have accomplished, whether you are headed out into the world to serve in the Auxiliary, Reserve, or the active duty Coast Guard (the Class of 2013 includes all three), public service elsewhere, graduate school, or the private sector. You yourselves have much to be proud of. 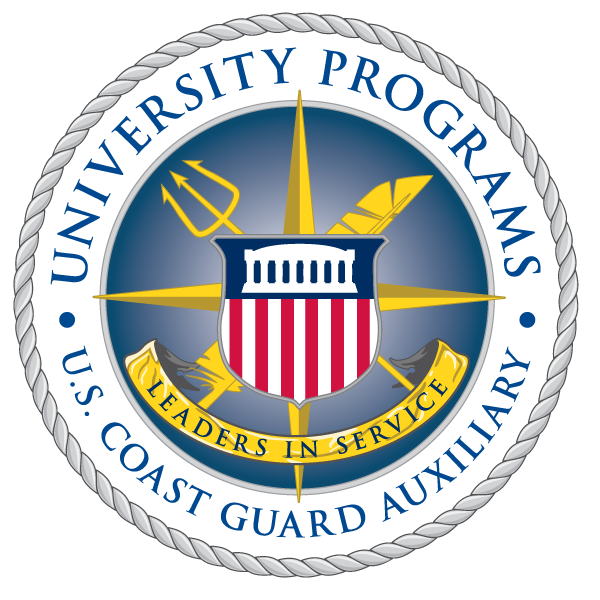 Pictured Left: Mike Piantedosi, Class of 2013 (right), served as Deputy Unit Leader at AUP Unit William and Mary before transferring to the Coast Guard Academy, from which he graduated on May 22, 2013. ENS Piantedosi will soon report to a Coast Guard Cutter home ported in Miami, FL. You inspire us at a moment in history when we wonder if America is still capable of getting big things done. Your work at the crossroads of some of our biggest national challenges in education, innovation, professional opportunity, and public safety has helped to forge a future AUP that is a model institution for others to follow. You are the first class ever to complete the rigorous nationwide program of study, and in so doing have met higher standards of academic and operational achievement than any students to ever before graduate from AUP. You have stood up some of the nation's most successful AUP Units. You have led your junior shipmates to great heights operating at the waterfront, responding to emergencies, making incredible contributions as interns, and as heirs to the long blue line of Coast Guardsmen -- Auxiliary, Reserve, and active duty -- whose Honor, Respect, and Devotion to Duty have distinguished our service for generations. Pictured Right: Jesse Thrift (bottom left), Cole Ashcraft (bottom, second from left), and Jacob Thayer (second row, far right), all class of 2013, were "plank owners" at AUP Unit Washington DC. Mr. Thrift is off to serve as Communications Officer with Flotilla Northern Virginia; Mr. Ashcraft will serve as Unit Officer at AUP Unit Washington, and Mr. Thayer, who will attend graduate school at the University of Texas, Austin, has already begun service as a Project Manager on the AUP national staff. I hope that you will not have this be the end of your service to your communities and country. You've come so far, made such a difference, and have at your feet far too great an opportunity to change the world. Don't turn back now, because we need you out there doing what you do best. As Steve Jobs, whose own Earth shaking legacy spanned nearly your entire education, famously said: "The people who are crazy enough to think they can change the world, are the ones who do." Go out and make it happen. Think different. Be great.